The NA-510 network appliance built with the new Intel Core i3, i5 and i7 processors in the LGA1156 package for small to medium businesses. The super slim 1U-height NA-510 utilizes the Intel Q57 express chipset and can hold 8 GB of none-ECC DDR3 memory. The NA-510 is integrated with eight Gigabit Ethernet ports with two pairs supporting LAN bypass function. For extended networking application, this easy-to-use unit comes with a MiniPCI or PCIe x8 slot. Moreover, the network appliance platform features two 2.5" SATA HDDs (or one 3.5" SATA HDD), one CompactFlash slot, a console port and two USB ports, which enhances its capability to deal with various application needs. 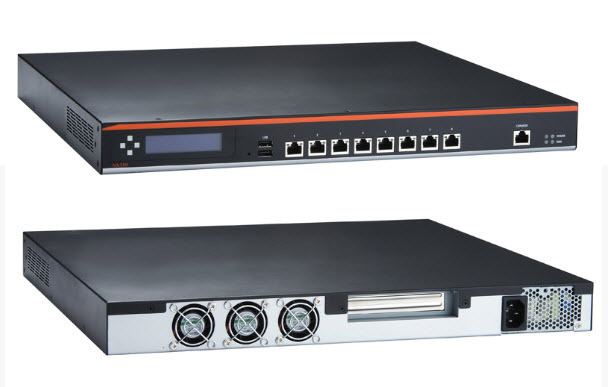 The extreme performance NA-510 network appliance is an excellent choice for network security applications, VPN, UTM, and Firewall. It supports LGA1156 socket for Intel Clarkdale i5-660/i3-540/G6960, Lynnfield i7-860/ i5-750 up to 8GB un-buffer non-ECC DDR3 DIMM memory. For storing event log data, the NA-510 utilizes two 2.5" SATA HDD or one 3.5" SATA HDD; limited support of SATA DOM as an option. It also supports two groups of LAN bypass through WDT and GPIO pin definition without any downtime.